Despite the UAE government’s nation-wide anti-plastic drive this year, only two out of five respondents to a survey said they are aware of government legislations about discouraging plastic use. The awareness seems to be the lowest amongst the younger generation (18-24 years) where little over a third knew of such legislations, emphasizing an urgent need to create more awareness about this issue, especially among this demographic, found the survey conducted by top online market research company YouGov. Plastic pollution is not just a hazard to public health but also a severe threat to the oceans and marine life. Recent reports show that 8.3 billion tonnes of plastic was produced in the UAE alone last year. Despite the government’s widespread efforts to solve this problem, there is low awareness among the masses. This alarming statistic brings us to the important question – How aware are people of plastic hazard in their city and how likely are they to change their lifestyles and go green? More than half (52 per cent) of UAE respondents showed great concern with the use of plastic in their city, especially those residing in Dubai and Abu Dhabi. Interestingly, a significant proportion of Asians (60 per cent) and those 40+ years (61 per cent) have expressed higher concerns over the indiscriminate use of plastic in their city. Plastics end up in the ocean and damage the marine environment. Close to two-third of respondents are concerned with excessive plastic waste leading to environmental degradation. Once again, the older generation is more alarmed about environmental degradation than their younger counterparts (18-29 years old), with three quarters of respondents aged over 40 years pointing out their concern. Reduce, Reuse and Recycle are the three R’s of plastic usage. The majority of the respondents (83 per cent) believe reducing the use of plastics is the most ideal way to protect the environment. From these individuals, more than half stated carrying a bottle to refill water (59 per cent) and avoided usage of plastic cutlery (56 per cent) as a way to contribute in reducing the use of plastics in their daily life. Half of the respondents also mentioned switching to ceramics/glassware at home, with an equal number avoiding the use of plastic/paper cups in the office in a personal effort to go green. Three quarters of the respondents claim to be re-using plastic as much as possible while 16 per cent completely disagreed to the re-using concept. Interestingly, a higher number of people between the ages of 30-34 years claim to be re-using plastic more than any other age bracket. The majority of respondents mentioned re-using plastic bags, with a sizeable proportion (close to 60 per cent) also re-using plastic bottles and take-away containers. The concept of reduce and reuse seems to be popular among the masses to combat excessive plastic waste. Comparatively women are more effective in adapting to these changes than men. We see they are not only reducing the use of plastics in their daily life but a higher number of females have also indicated reusing plastics across the board. 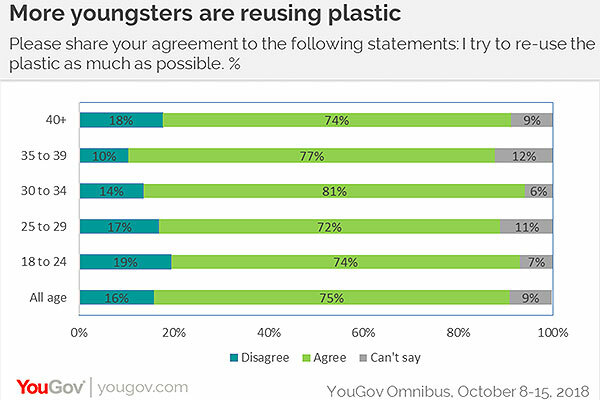 When it comes to recycling plastics, a quarter of all respondents either disagree or are not sure about recycling plastic. The UAE residents stay divided on their opinion of plastic items being banned and there is no overwhelming support of banning a particular plastic product. This is in contrast to the findings from the UK, where by a wide margin, the population showed to be more likely to support than oppose a ban across all products. A ban on disposable coffee cups and foam egg boxes gains the highest level of support from UAE residents, with over half of respondents supporting the ban. Compared to females, men demonstrate more support of banning these particular items. A little under half proposition the ban on drinking straws, takeaway containers, plastic shopping bags, wet wipes and sanitary items. Interestingly, a ban across items on the list was more supported by those between the ages of 30-39 years especially when compared to the older generation.